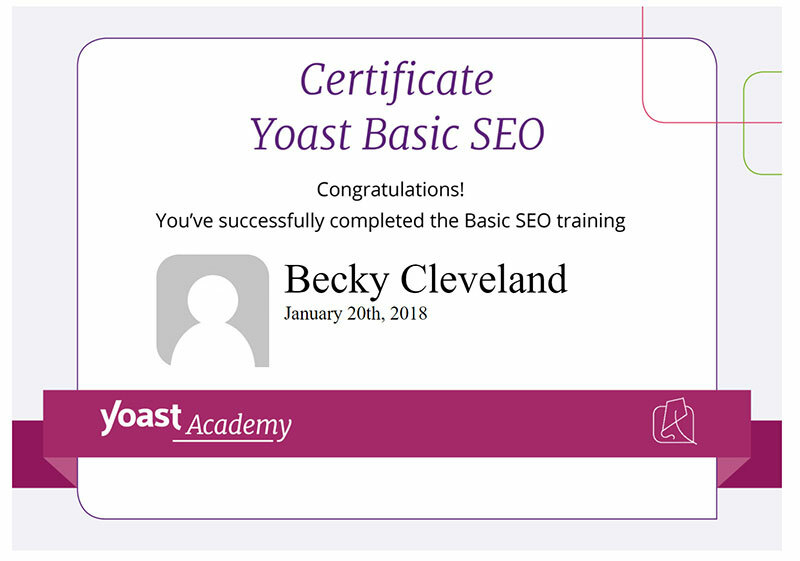 WHAT EXACTLY IS BASIC SEO CERTIFICATION? We all know SEO (search engine optimization) is what we all strive for. We want to rank in the search engines beating our competition. While that is not easy to come by it does help to have the right plugin and training on how to maximize the tools. There are many factors involved in SEO which change daily making it impossible for any one person to ‘know it all’. DOES THIS MEAN I AM AN EXPERT IN SEO? No! It means I am interested in helping my clients as much as possible in helping them reach their goals with their website. What I did learn in the course is there was alot to learn on an ongoing basis about SEO. It is very technical and time-consuming as a lot of planning goes into your SEO strategy. Just remember…you do start off on the right foot by working with someone who has had some basic SEO training! Let me know if you are interested in maximizing all the Yoast SEO plugin has to offer.